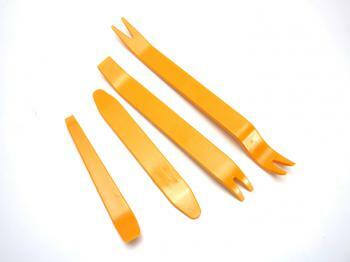 The Body Molding and Interior Trim Removal Tool Set is excellent and basic for automotive signs, graphics and vinyl wraps, paint protection installation as well as window film tints. For DIY enthusiast, this kit also would be a handy addition. The kit includes 4 distinctive tools for the easy removal of body fasteners, interior trim pieces, exterior body moldings, wheel hub caps, etc. Made from heavy-duty plastic to prevent scratching and damage to vehicle surfaces.